Warning: As I do not play the game as regularly as I used to, I am no longer keeping this guide up to date. It will, therefore, not address any changes post Patch 1.2. Barring any major revisions, the basics should remain relevant, but you have been warned. Because I will no longer be updating this thread, I'm giving free and open permission to take, edit, and use it's contents in any way. If someone would like to use this guide as a base for continuing updates, that's fine. NOTE: Please refer to the FAQ before asking any questions. I welcome any questions, but if your question is answered in the FAQ section I will merely refer you back there. If your question is in the FAQ, but the answer still doesn't clear it up for you, mention that and I will address it. What Can I Reverse Engineer? Certain Custom items, often weapons, can be reverse engineered when they have mods in them. They seem to yield no results other than what would result from reverse engineering the mods they contain. Current knowledge indicates Custom shells themselves yield no additional results. This is a bug that we're investigating. As theorized above, you can work around this by inserting low level mods. You only need the armoring. The results of RE will be unaffected - I was able to learn the recipe from the specific item mentioned here with nothing but a level 10 green armoring in the shell. There's a limitation that prevents reverse engineering these items currently. We are working on addressing the issue. 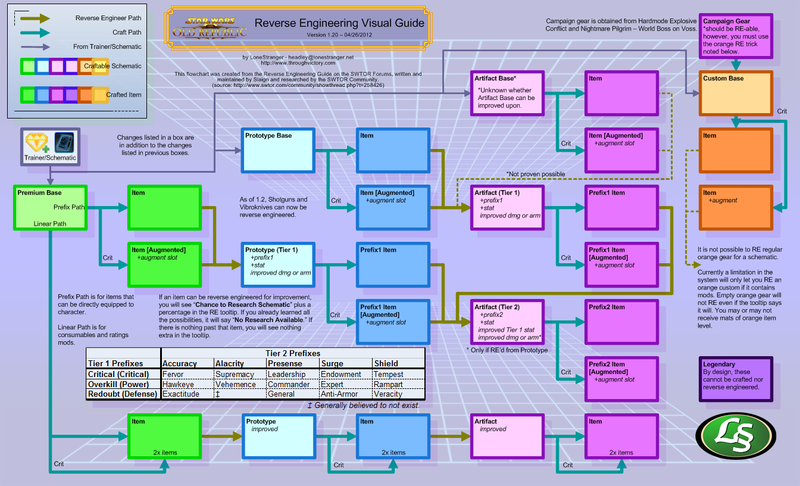 Reverse Engineering can follow 2 possible paths. Which path the item you are trying to RE follows depends on whether or not it is equippable. If an item can be equipped directly to your character (Weapons and Armor) it will follow the prefix path. If it cannot be equipped directly (Mods, Stims, Etc.) it will follow the linear path. The linear path is the simpler of the two, so we'll cover that first. Reverse engineering non-equippable items is fairly straight forward. You start with a base item which is learned from a trainer or schematic and when you Reverse Engineer it, you have the potential of discovering a schematic for an improved version of the item. Once you find the improved schematic, you are done with the base item and can begin reverse engineering the improved item for a chance to improve it further. Finding an improved item increases it's quality to the next tier. A Premium item will become a Prototype, and a Prototype will become an Artifact. Once an item following the linear path becomes Artifact, there are no further improvements possible. Buckle in, this is where things get crazy. Rather than following a linear progression, equippable items follow a complex branching system which allows for a huge variety of improved items. I'll try to start out simple and go into more detail, but this is a complex enough system that it requires a thorough explanation. Base Item - A base item is an item learned directly from the trainer or a schematic, as opposed to via reverse engineering. Any item learned from a trainer or schematic is a base item. Prefix - A prefix is a word appended to the beginning of an item name. These words differ based on the stats added to the item upon improvement. More on that later. Tier 1 Prefix - This refers to the three prefixes that can be acquired by reverse engineering a base item. Specifically, these are Redoubt, Overkill, and Critical. Tier 2 Prefix - This refers to the 14* prefixes that can be aquired by reverse engineering a Tier 1 Prefix item. The Tier 2 Prefixes are as follows*: Anti-Armor, Commander, Endowment, Exactitude, Expert, Fervor, General, Hawkeye, Leadership, Rampart, Supremacy, Tempest, Vehemance, and Veracity. *Note: Based on how the system works, it was assumed by me and others that Redoubt would have 5 descendant prefixes like both it's siblings, but that it was bugged. As Patch 1.2 has not added/fixed this Prefix, I am now assuming it was never meant to exist, as odd as that seems. A note about these terms: This guide's first version was written during Early Access, and these are the terms I came up with to describe the theory then. As a result, these are the terms people are using in this thread. I have been told, however, that others in the community are using other terms. This is to be expected. To maintain the internal consistency of this thread and avoid confusion, I've chosen to keep these terms. So you may hear different terms (For example, one person told me he felt the proper phraseology was Base = Tier 1, Tier 1 Prefix = Tier 2, and Tier 2 Prefix = Tier 3). If enough people ask me to change the terms used in the guide I will, but for now I think what we have here works well and is more descriptive than other propositions. Okay, now that you're familiar with the terms, lets delve into the system itself and what they really mean. Every item starts as a Base item, learned from a trainer or schematic. If you learn this schematic and craft the item, you can then reverse engineer it. Unlike the linear progression path, this system branches off down separate paths. This means you can find 3 improved versions of every Base item by reverse engineering that item. These improved items carry the Tier 1 Prefixes of Redoubt, Overkill, and Critical. When you improve upon an equippable item by creating a Tier 1 Prefix schematic, a new stat is added. What this stat is, is dependent on which Tier 1 Prefix you discovered. Redoubt adds defense, Overkill adds power and, predictably, Critical adds critical. Tier 2 Prefix items are a little bit more complex. They are discovered by reverse engineering Tier 1 Prefix items. Each Tier 1 Prefix item (of which there are 3 for each Base item) can be reverse engineered into 5 Tier 2 Prefix items, except for Redoubt which only has 4, for a total of 14 Tier 2 Prefixes. The process, therefore, is to reverse engineer base items until you have 3 Tier 1 Prefix schematics. From there, you would reverse engineer each Tier 1 Prefix version of the item until you have 5 Tier 2 Prefix versions for each Tier 1 Prefix*. *Note: Again, remember that only 4 schematics are findable by reverse engineering Redoubt items. When an item improves from Tier 1 Prefix to a Tier 2 Prefix, the same thing happens as going from Base to Tier 1 Prefix. A second new stat is added. While the original stats present on the Base item retain the same values throughout the improvement process, the stat gained from the Tier 1 Prefix (Critical, Defense, or Power) will improve when this happens. The end result is a better item with a total of 2 additional stats in comparison to the Base item. Another effect can occur when an item is improved, in that an item can progress to a higher quality. This will always happen if the Base item is Premium or Prototype, however current collective experience implies that crafters cannot improve items above Artifact. It is important to note that the quality of the item has no direct bearing on it's Tier. A Base item can be of any quality. A Base item of Premium quality will improve into a Prototype when it becomes a Tier 1 Prefix item. A Base item of Prototype quality will improve into an Artifact when it becomes a Tier 1 Prefix item. Tier 2 Prefix items are always Artifacts. If the Base item is Premium, the Tier 1 Prefix item is a Prototype, and the Tier 2 Prefix item is Artifact. If the Base item is a Prototype, the Tier 1 Prefix item is an Artifact, and the Tier 2 Prefix item is also an Artifact. Also note that any time an item improves in quality, it also improves in rating. This means it acquires more armor if it's a piece of armor, or damage if it's a weapon. Custom items have no innate stats, and so cannot be improved via reverse engineering. However, they can be critically crafted, more on that next. The basic premise of critical crafting is this: You have a small chance upon crafting an item to "Critically craft" said item. This has differing effects based on whether the item is non-equippable and thus follows the linear path, or equippable and thus follows the prefix path. Item Modifications, Stimpacks, and other linear path items create duplicate items when critically crafted. For equippable items, the basic rule is simple: Critically crafting an equippable item gives it an open Item Mod slot for a mod of the type "Augment." Augments are crafted by various professions with schematics discovered via Slicing. When an item is critically crafted and receives an Augment slot, it gains the suffix [Augmented]. Can Custom (Orange) items be critically crafted? You should be able to Reverse Engineer anything you can craft. You can also reverse engineer world items that fall in line with what your profession can make. Just because you can reverse engineer something does not mean you can learn from it, however. To find out what you can Reverse Engineer, simply click the Reverse Engineer button, and it will highlight items it is possible to Reverse Engineer. If you can discover schematics by Reverse Engineering an item, it's tooltip will show a note reading "Chance to Research a Schematic:" with a percentage chance of success. If you have learned every available schematic from an item, it will say "No Research Available." If you can Reverse Engineer an item, but it has no tooltip, there are no schematics to be learned from it. These tooltips only appear while the Reverse Engineer button is pressed. 1. Can I reverse engineer my Artifact to gain a better schematic? In some situations, yes, in others, no. If your item follows the linear path (mods, stims, etc.) there are no further improvements available through reverse engineering after reaching the Artifact level. 2. Can I reverse engineer dropped or quest items? If it falls within the category of items you can create, yes. 3. How do I gain a specific Tier 2 Prefix? Check the chart in the guide and reverse engineer the Tier 1 Prefix that leads to the Tier 2 Prefix you want. If you don't get lucky and get the one you want, keep going until you do. It's a matter of time and luck. 4. Can I get all of the Tier 2 Prefixes for one item? 5. Can Custom items be critically crafted. 6. Can X item be reverse engineered for schematics? I haven't seen a schematic and I've RE'd dozens! Probably. Watch for the "Research Available" tooltip. 7. Will reverse engineering a Tier 1 Prefix item of Artifact quality cause the Tier 2 Prefix item that results to be of a higher rating? No. Rating only changes when color quality changes, and Tier 1 Artifacts reverse engineer into Tier 2 Artifacts. Both are Artifact quality. 8. How do I know if my prefix is Tier 1 or Tier 2? Tier 1 Prefixes are Redoubt, Overkill, and Critical. Tier 2 Prefixes are any other prefix. 9. Can I reverse engineer a Custom item for a better schematic? 10. What happens when I discover a prefix that adds a stat an item already has? The amount of the stat in question goes up substantially. In other words, if reverse engineering an item for the Redoubt prefix would normally give +6 defense, but the item already has 6 defense on it, it will end up with 12 defense. 11. How do I discover Custom items? You can discover Custom items via Underworld Trading missions or buying the schematics from other players. *New methods may be available for some items in Patch 1.2. I will update when I have more information. Some people have contributed information and ideas that have changed this guide for the better, and I try to list those people here. Please take the time to read through their names and recognize their contributions. Hello everyone! Because the previous version of this thread has exceeded our normal threshold for thread length, we've started this new version for the community to continue discussion of this very helpful guide. Reposting this since previous thread was closed. Can components such as: Hilts, Color Crystals, Enhancements be Critically crafted? What about Implants, Ear pieces & Relics? No they can't. Even though BW said that it should possible and that you should get 2x item on a crit, in the live game this doesn't work. Yes they can all crit, you will get an augment slot when they do. Regarding a post in the previous thread about what lvl crafted gear is on the GTN (saying it's all 50 gear), I disagree. I'm one of the few techblade crafters on my server. I make blades from lvl 25 through 50 (both blue and purple). While my prices are a little high, I have product there for everyone. I don't make guns at all because there's so many of them that are looted, that buying them is a waste. Barrels are "ok", but not my bread and butter. Good crafters should know that they'll make more $ from the 21 - 41 lvls than from the 50s (unless you're in biochem). depending on server their are clearly markets to be taken by crafter for sure. But this is the RE thread. RE is completely random but for your sake when you get to level 50, just stack all your crafted pieces into one of your ship bay, and when you have enough, RE all of them in a row you should not come out empty handed (whereas REing every ten or 20 may leave you disheartened). And to finance you REing, you may want to RE objects that are not for you to blue or purple (starting from blue/green) and sell them. For example I have no luck on getting tier 2 for my sentinel armors needing mandalorian iron from tier one up. Right now I am making gear for consular either shadow or sage (focus on defense for tanks specs / power/crit/surge for heal/dps as alacrity leave you without casting ressource so is not that pursued for end game PVE on my server). Since no one else is doing this, the grade 6 silk is cheaper than mandalorian iron and I am paying my personnal REing by sselling cheaper to RE objects at the same price as more expensive to RE objects (because player not crafting armor do not see costs of material only results and are ready to use the same budget for one armor piece). Congrats everyone on 1000+ posts of RE information and discussion, and here's to 1000+ more! Just to repost a previous question which didn't get answered.. Is it possible to remove an enhancement from a purchased PvP reward item, say a lightsaber, then try to RE it for the schematic? The enhancement in question is "Triumphant Enhancement 20"
Previous wisdom says the answer is NO because one cannot craft that enhancement normally, but the enhancement has all the qualities of falling in a linear pattern (it's blue, numbered, and has stats very competitive to similar trainer taught enhancements). Seeing as how I'm not level 50, it's likely the schematic is a world drop that I just haven't encountered yet, but I'd be curious to know if it's possible to make this.